Do Processed and Red Meats Cause Cancer? The latest health scare involving processed and red meats and your risk of cancer may have exaggerated the threat to your health. Here are the missing facts from the sensational headlines. One headline suggested eating processed meat was just as bad as smoking and drinking. Another claimed that eating bacon would cause cancer. With bold claims like this, it was hard to miss the reports on your Facebook feed and from traditional news outlets that came down in late October 2015: eating processed and red meat was linked to various cancers. But interpreting scientific research properly and thoroughly takes more than many news reports might lead you to believe, so let's take a closer look at the most recent research and what it really means. In October 2015, 22 scientists from around the world2 evaluated the risk of cancer from eating red and processed meat. The group assessed more than 800 studies investigating the association of cancer with consumption of these kinds of meat, and concluded that diets high in processed meat were positively associated with colorectal cancer. Furthermore, consumption of red meat was linked to cancers of the pancreas and prostate. Sounds damning. The report spawned headlines like, "Eating Processed Meat Is Just as Bad as Smoking and Asbestos. "3 (A real headline, mind you.) But how can indulging in a juicy ballpark hot dog cause the same detrimental health effects as smoking a pack of cigarette a day, you ask? Let me explain. The report placed processed meats—which includes meats that have been transformed through smoking, fermentation, or other processes to enhance flavor and improve preservation—into the Group 1 category, "carcinogenic to humans," suggesting there was sufficient evidence they could cause cancer. Other substances that have received the same rating as Group 1 include alcohol, asbestos, and tobacco smoke. However, just because processed meats and tobacco smoke are in the same category, this most definitely does not mean they are equally hazardous to your health. For example, smoking causes a 20-fold increase in a person's risk of developing lung and other forms of cancer. In comparison, eating processed meat increases a person's risk of colorectal cancer by a factor of about 1.1-1.2 for each serving consumed per day. Red meat, on the other hand, was categorized as "probably carcinogenic" because of the limited evidence available. However, the panel of scientists did conclude that diets high in red meat were linked to pancreatic and prostate cancer. This is good information to know, but let's take a closer look at how they collected the data. 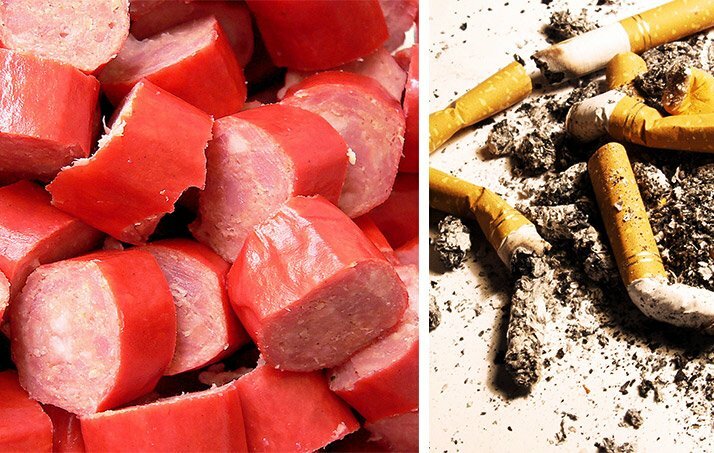 Just because processed meats and tobacco smoke are in the same category, this most definitely does not mean they are equally hazardous to your health. Most of the evidence linking meat consumption to cancer comes from cohort studies. Cohort studies are commonly used in medicine to analyze specific risk factors in a group of people. While they can provide a great deal of information, data on potential confounding factors is often missing. Things like diet, levels of physical activity, and overall lifestyle can be excluded from the results, which means that interpreting the data can give unclear or even misleading results. On the other hand, we know that smoking causes 90 percent of lung-cancer deaths among men and women. Smoking also causes more deaths each year than HIV, illegal drug use, alcohol use, motor-vehicle injuries, and firearm-related incidents combined. There is also clear evidence that excessive drinking can cause heart and liver failure, cancer, and a weakened immune system. Bottom line: The risk for cancer is far greater from smoking than it is from eating meat. Smoking and drinking pose far greater health risks than meat. Throwing away the cigarettes and monitoring your alcohol intake are far more beneficial than giving up red or processed meat. Can enjoying a couple slices of bacon alongside your morning eggs and toast really increase your risk of getting colorectal cancer by 18 percent? According to the most recent findings, yes it can. But before you throw out all your Farmer John bacon, let's consider some other statistics. Regardless of what type of diet you follow (e.g., meat eater, vegetarian, or vegan), your lifetime risk for developing colon cancer is about 5 percent. Let's say you were to eat deli meat, a hot dog, or some other form of processed meat every day for the rest of your life. Your risk for colon cancer would increase to about 6-7 percent, which is, mathematically, an 18 percent increase. So while your risk does increase, it's in fact a very, very small increase. Bottom line: Factors such as physical inactivity, obesity, alcohol, and tobacco increase your risk for cancer far more than meat does. Take care of those first before you give the axe to your morning bacon. This isn't the first time red meat, a staple in many bodybuilding diets, has gotten a bad rap. First, the saturated fat found in fattier cuts of meat was linked to an increased risk of cardiovascular disease. Now we're being told that cooking red meat can actually increase the chances of getting pancreatic and prostate cancer, because of the production of carcinogens (cancer-causing agents). Taking a look at the latest report, the panel of scientists placed red meat in the category of "probably carcinogenic," suggesting it may increase your chance of getting cancer, but there's not enough evidence currently to link the two together. So if there's not enough data showing that red meat causes cancer, why all the fuss? Two words: mechanistic evidence. Mechanistic analyses examine changes in one variable that could lead to a change in other variables. Research suggests that it may not necessarily be consumption of red meat that increases your risk for cancer, but rather how you cook it. Cooking improves the digestibility and palatability of meat, but grilling up your favorite cut of steak or pan frying some juicy burgers can significantly increase the formation of carcinogenic chemicals in your meat. Meat heated at a high temperature contains heterocyclic aromatic amines (HAA), an agent that can damage genetic information within a cell, causing mutations and possibly leading to cancer. Additionally, meat smoked or cooked over a heated surface or open flame contains polycyclic aromatic hydrocarbons (PAH). Similar to HAA, these chemicals can cause DNA damage and may increase your risk of cancer. Research suggests that it may not necessarily be consumption of red meat that increases your risk for cancer, but rather how you cook it. Don't burn your meat! Stick to lower cooking temperatures, and refrain from cooking over an open flame. The oven, a George Foreman grill, or the stove top over low to medium heat are preferable options. Monitor your red-meat intake, and limit it to three 4-ounce servings per week. Studies demonstrating DNA damage following high meat consumption were using 10-15 ounces of red meat per day. Stick with smaller serving sizes. 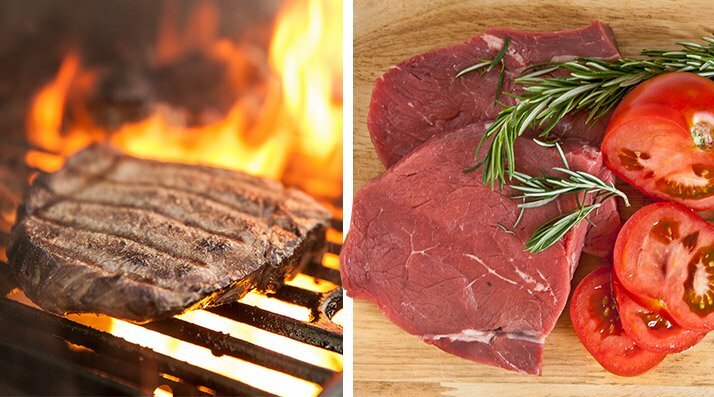 Don't forget about the health benefits of red meat. Calorie for calorie, beef is one of the most nutrient rich-foods. Red meat is a great source of protein, and is also high in iron, vitamin B-12, and zinc, which helps to keep your immune system working properly. Bottom line: You can have your meat and eat it too—just use moderation! So what should you take away from all of this? Well for one, consuming large amounts of red and processed meat can increase your risk for colorectal cancer, just as consuming large quantities of fat and sugar can increase your risk of becoming obese, developing type 2 diabetes, and getting cancer. Consuming too much of anything can be bad. In the grand scheme of things, eating a couple slices of deli meat or enjoying a hot dog on game day won't do squat to harm to your health. But if you're concerned about cancer, enjoy your meats in moderation, follow a balanced diet, work out regularly, quit smoking, and only drink in moderation. Turns out, Mom was right. Ferguson, L. R. (2010). Meat and cancer. Meat Science, 84(2), 308-313. Lyon, F. (2014). IARC monographs on the evaluation of carcinogenic risks to humans.